Apparently Robert Novak was among the GOP faithful that was less than impressed with former U.S. Senator Fred Thompson's appearance at the Lincoln Day Dinner in Orange County, California. Described as a "letdown" for the conservative audience in attendance, the event turned out to be a non-event for those looking to Thompson as their right-wing messiah. Will the man many in Louisiana are looking to as the "true consevative" in the WH '08 race be a contender or pretender? 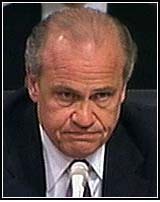 If Friday was any indication, Fred Thompson is no Ronald Reagan.